This short humorous story is all about a sharp minded and brilliant crow. This is a quite interesting story for all the people. Here you will know how the sharp minded crow has played a game in defending its eggs from the snake. I hope that you will enjoy reading the story. Once upon a time in a dense forest there lived a crow with its children. Once due to the heavy rainfall the nest of the crow was collapse down from the tree and was destroyed fully. The crow decided to find the safer place for itself and its children to live happily without facing any problem anymore. Soon he found the best place to build up the nest in a big shady tree nearby the kingdom palace. At the same day, the snake with its family built up the home and started living there. But the unfortunately whenever the crow used to lay the eggs the snake attacks on it. The snake to feed the hunger used to attack the eggs of the crow to fill the empty stomach. The crow was helpless. The crow then decided “I should go and talk to that evil snake that he should search something else for feeding hunger rather attacking its unborn and hatched eggs”. 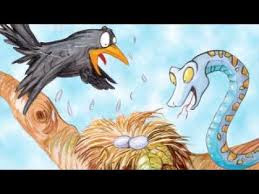 The next day the crow went to that evil snake and said” Please dear friend spare my lovely eggs. Let us live together happily being good neighbors and not disturbs each other anymore”. The snake replied arrogantly “Huh! What do you expect from me, to die simply just because of hunger, eggs are what which I can use for feeding my and family hunger”. The crow was very much angry, and she thought to make the snake to teach a lesson. Let us see what happens next in this short, interesting story. Next day, the angry crow was flying over the palace of the king. The crow saw the beautiful princess wearing the diamond necklace which was very much expensive. Suddenly a though flashed into the mind of that brilliant crow, and she flew towards the princess and picked up that necklace using its beak and flew off towards its nest. When the crow flew off with the necklace, the princess screamed that “somebody, please help that crow has taken away my beautiful and expensive necklace”. Soon the guards of the palace were running in search of the crow. Within a short time, the guards have approached to the crow. They saw the crow sitting on the tree. The crow dropped the necklace on the ground and by hearing the noise the snake with its family came out of the house. The guard saw the snake. “A snake! Just kill the snake and its family”. They all beat the snake and killed the family. Then the guards went back to the palace and returned the necklace to the princess. This way the witted-minded crow has taken its revenge from the evil snake. The crow though that “Now my eggs are safer and I can live peacefully and happily without facing any trouble anymore”. I hope that you might have enjoyed reading the short story and came to know that how the crow has taken the revenge from the snake and proved it to be a brilliant bird. TAGS- Interesting stories, humorous stories, short stories.